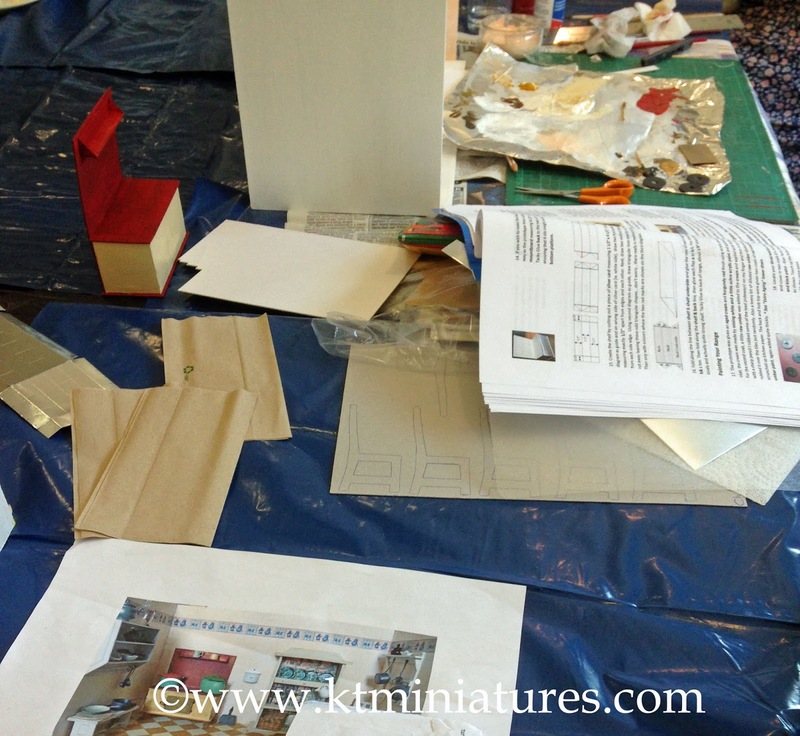 KT Miniatures Journal: Lovely Photos Of Jane's Completed Workshop Project! 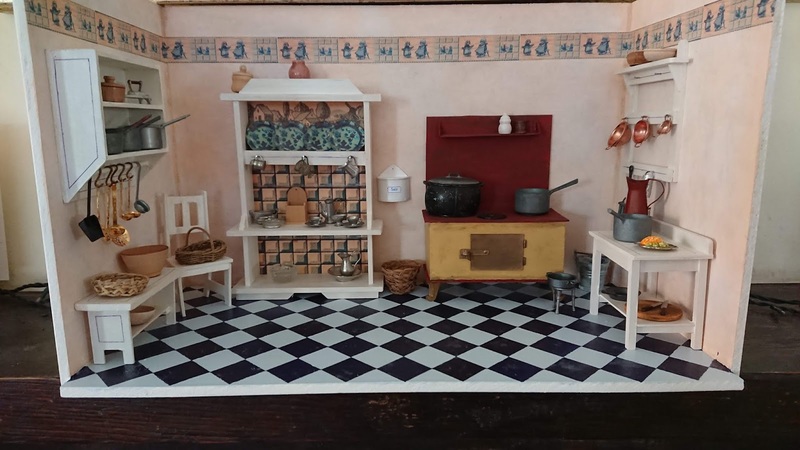 Lovely Photos Of Jane's Completed Workshop Project! Followers of KT Miniatures may remember earlier in the year I had promised that if anyone who came to my 2018 workshops sent photos of their completed project, I would show you on here....with their permission of course! Jane Sharp was one of the lovely ladies who attended the May workshop. During her time with us, she had mentioned that she was just about to have a knee operation, and that she was looking forward to carrying on with the project during the few weeks of recuperation, following her operation. A couple of weeks after Jane's op' she emailed to say that she had been able to get going with her project as planned and sent some photos of the project in progress. 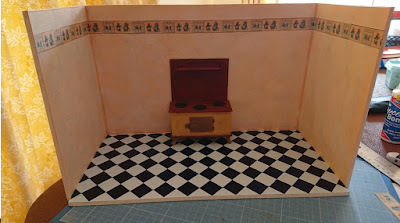 She had managed to paint the tiled effect floor, and chosen to have a mixture of blue and white tiles. She had mixed a pale blue paint with a dark blue paint, in order to get the shade that she wanted. I agree with Jane that very oddly, the floor looks like it is black and white in the photos, but it is most definitely blue. Jane said that she took it slowly and carefully, and although there was a bit of touching up to do, she was thrilled with result. I think it looks super! 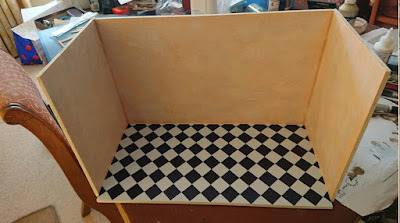 The tiled effect floor can be quite tricky as the paint has a tendency to bleed underneath the masking tape sometimes, no matter how carefully the paint or indeed the masking tape is applied. But any "bleeding" can be easily rectified by "touching up" with the relevant colours using a tiny brush. 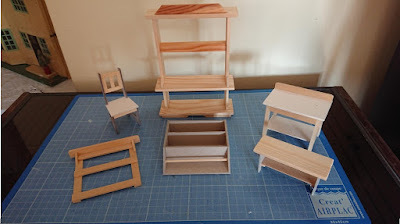 Above you can see that Jane had made good progress with her kitchen range whilst she was actually at the workshop. And here is the finished kitchen range...it is brilliant. 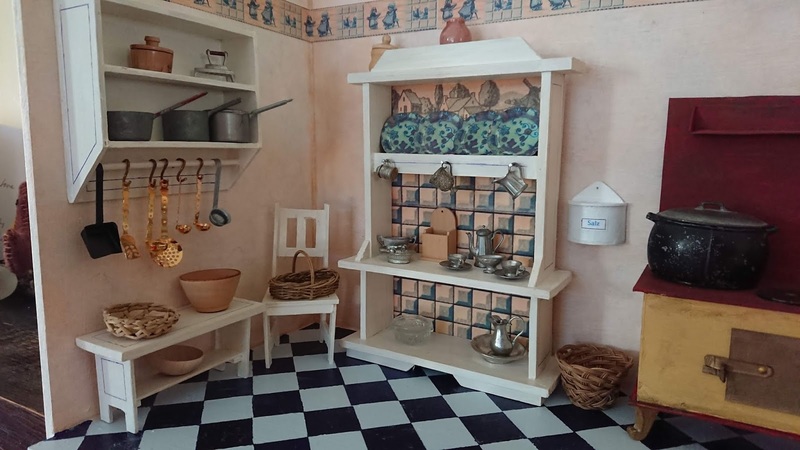 The reproduction blue/ beige Delft type frieze was part of the project and Jane is delighted with how the colours of the frieze and floor go together well. Jane had also finished creating and constructing all the furniture which were part of the workshop project. And now...just a few more weeks further on, Jane sent me photos of the finished project, with all the furniture painted and accessories created. She has also added some of her own bits and bobs in varying scales that she has been collecting for this project. 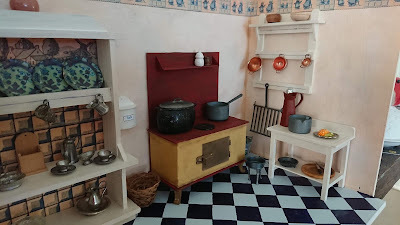 In the antique toy German kitchens of the early 1900s the contents would have been in different scales, and I personally love to see the varying scales combined in antique/vintage style miniature settings - it adds authenticity and character to the overall effect. 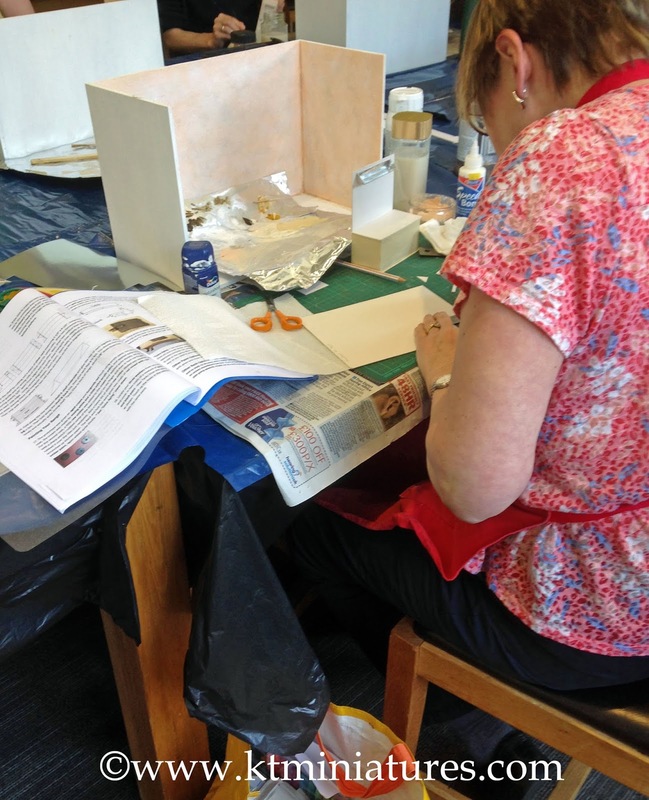 Jane said that she thoroughly enjoyed making this project and adds...."it is amazing what you can do with wood, card, paint and some lovely accessories". Well...it has given me great pleasure to see such a stunning example of this workshop project created, it really is beautiful. I am very grateful to Jane for allowing me to share her photos with you and hope that you have enjoyed taking a peek too. If you CLICK HERE you can see full details of the workshop project and more photos. I hope to bring you details of KT Miniatures 2019 workshop project later this year. Labels: Early 1900s German Style Kitchen, KT Miniatures 2018 Workshop Project, Paint effect Tiled Kitchen Floor. Wow!!! Congratulations to Jane - this really is a fabulous project. Her selection of accessories is absolutely perfect and enhances her finished kitchen. A lovely project Celia and a great workshop. Celia - Thanks for posting- wow!- this is great! Jane has done a fabulous job of finishing the Kitchen with all the details- and certainly such a Dolls' House activity would be just the thing for recovering from an operation- Well done indeed. Regards. KEV. Congratulations to Jane! What a wonderful job she's made of this room set. Congratulations to you too, Celia, as her tutor! Celia- while your sweltering there in the UK- it is freezing here in the SW of Sydney...rugged up in jackets and beanies...overnight -2degC...through the day it is warm- the house remains so cold all day. Still managing some Dolls' House planning in my Shed though...and went out at mid-day to a Local Cafe' to have coffee- sitting in the Sun. Regards. KEV.